Higher temperatures and lower flows in the Snake River are resulting in an earlier than usual change in summer hydro operations. This week the U.S. Army Corps of Engineers increased the outflow of Dworshak Dam's cool water to help keep the lower Snake River cool, which was measured this week near 68 degrees Fahrenheit. That's the temperature number in Lower Granite Dam's tailwater that triggers summer cooling operations in order to protect salmon and steelhead listed under the Endangered Species Act. In addition, the Corps transitioned to summer spill operations at lower Columbia River dams and will do the same next week at Snake River dams, and it changed minimum operating pool levels at some Snake River dams to ensure a safe entrance to locks for barge traffic on the river. This after a spring season of compromises and operations as a result of one of the worst water supply forecasts on record, making 2015 the 51st worst year out of the last 55 years. The Northwest River Forecast Center had initially predicted that the April-through-August runoff volume at The Dalles Dam would be less than 72.2 million acre-feet, or less than 82 percent of average. However, the May forecast for the period dropped the prediction to 62.4 million acre-feet, or 71 percent of average. When this happens, water and fishery managers of the Technical Management Team generally shift as much water as possible to aid juvenile migrants in the spring, understanding that using water earlier risks the supply of water normally available in the summer for flow augmentation and for reducing instream temperatures. At last week's Northwest Power and Conservation Council meeting in Coeur d'Alene, Idaho, the Bonneville Power Administration's Tony Norris said more than half of the estimated 8 million acre-feet of flow augmentation for this spring and summer was provided from reservoirs in British Columbia under the Columbia River Treaty and the Non-Treaty Storage Agreement. That strategy was successful and resulted in average or near-average travel time for downstream juvenile migrants, said Ritchie Graves off NOAA Fisheries, also at the Council meeting. "The bottom line for us is that we care about migration timing because fish that arrive later to the ocean generally return in lower numbers as adults than fish that arrive earlier," Graves said. "We're eager to see how fish respond to the hydrosystem conditions this year." The last time the dry year criteria was triggered was in 2010. If the current dryness continues into 2016 or later, "I'm confident we could handle it," the Corps' Steve Barton said. Some of the impact from spring flow choices is already showing in the lower Snake River where the temperature in the Lower Granite Dam tailrace measured within one-half of a degree of the 68 degree trigger, according to Steve Hall of the Corps' Walla Walla office. The Corps, he said, slightly increased the outflow at Dworshak Dam Wednesday, June 17, from 3,000 cubic feet per second to 5.3 kcfs. "We'll have a little bit of a cooling period the next few days," he said. "But there is a warming trend over the weekend and we should get fairly close to the target (68 degrees) then, but we should squeak by." He added that river temperatures have heated up to this point about three weeks earlier than last year. The Dworshak Reservoir on the North Fork of the Clearwater River this week is just one-half foot from a full pool, but the water is needed now so the lower Snake River will remain within its temperature limits to ensure adequate water conditions for returning adult chinook and sockeye. Outflow from the dam comes from the bottom and coolest part of the Dworshak pool and is typically used in summer months to keep water within the 68 degree limit for fish set by the federal biological opinion for Columbia-Snake river salmon and steelhead. Still, Hall said, the Corps would like to conserve as much Dworshak water as possible now while meeting the 68-degree obligation. With outflow at 5.3 kcfs, he expects the Dworshak pool to be five feet from full by the end of June. By the end of July this year, the pool could be 25 feet to 50 feet from full. Currently, there is a temperature buffer of one to one-half a degrees. Hall said if the cooling goal was closer to the 68 degree target, some water could be conserved and that water could be used later in the summer. As it is, water that the Corps would have this year for August cooling would be borrowed from water typically used in September. At the TMT meeting Wednesday, Russ Keifer of the Idaho Department of Fish and Game suggested the operations remain on the cooler side in order to get the adult fish up through the system and then take another look in July to determine how to manage the operation through August. He said 90 percent of the adult sockeye run is usually through the Snake River by the end of July. The Corps also moved to summer spill operations to aid fish passage at lower Columbia River dams (Bonneville, The Dalles, John Day and McNary dams) this week, beginning the new operations Tuesday, June 16. 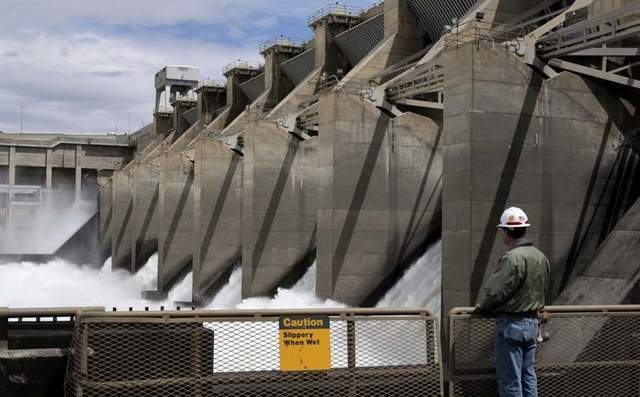 It will transition to summer spill operations at the four lower Snake River dams next week, beginning June 21. Summer fish operations will continue at these eight dams until August 31. In a statement, the Corps said summer spill for fish is in accordance with the 2015 Fish Operations Plan and is similar to last summer's operations. "Jointly developed by federal and regional fish managers, the goal is to provide timely and safe passage of juvenile salmon through the hydropower system during their outmigration to the ocean," the Corps said. "Spill for fish passage is one of several tools utilized to facilitate safe and expedient passage at the mainstem hydroelectric dams. "Through a coordinated set of actions, the federal agencies are working with state and Tribal partners to enhance juvenile and adult salmon and steelhead survival, meet fish survival performance standards required by the 2008/2010/2014 Biological Opinion, and provide benefits to resident fish." With flows dropping below 32,000 cubic feet per second, the Corps on Tuesday changed its spill operations at Little Goose Dam from spilling 30 percent of the river to a constant spill of 11 kcfs. Doug Baus of the Corps said that, as in previous years, this operation has to do with efficient operations of the generating units when river inflow at Little Goose is equal to or less than 32 kcfs (the operation is described on page 6 of the Fish Operations Plan). Along with constant inflow from Lower Granite Dam, he added that the operation often makes it difficult to achieve the required spill levels downstream at Lower Monumental Dam and to also maintain minimum operating pool levels. LGS current hourly information is found at: http://www.nwd-wc.usace.army.mil/report/projdata.htm. On Sunday, June 14, the Corps increased MOP at Little Goose Dam from MOP (633.0 - 634.0 feet) to MOP + 0.5 feet (633.5 to 634.5 feet). In addition, on Monday it increased the MOP range at Ice Harbor Dam (IHR) from MOP (437.0 - 438.0 feet) to MOP + 0.5 feet (437.5 - 438.5 feet). The Corps moved to this MOP to ensure that barges navigating the Snake River would have a safe entrance into the navigation locks at Lower Granite and Lower Monumental dams during periods of low flow (50 kcfs or less). Lower Granite average outflow on Sunday was 35 kcfs and was 33 kcfs on Monday at Ice Harbor. Meanwhile, the National Oceanic and Atmospheric Administration said this week there is a greater than 90 percent chance that El Nino, associated with warmer temperatures in the Northwest, "will continue through Northern Hemisphere fall 2015, and around an 85 percent chance it will last through the 2015-16 winter. "During May, sea surface temperatures (SST) anomalies increased across the central and eastern equatorial Pacific Ocean. Collectively, these atmospheric and oceanic features reflect an ongoing and strengthening El Nino."